Seeing the game live used to be enough for sports fans. Now, stadiums are designed to be a multi-screen experience. 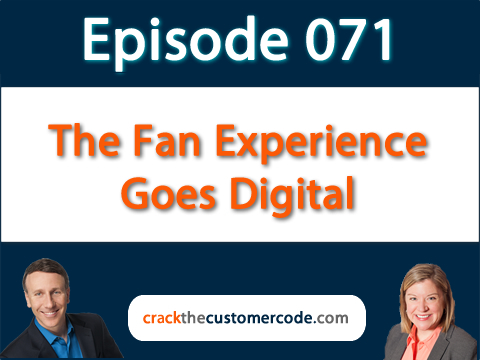 How are experiences changing for sports fans, and how are the champions delivering victories? What is the product of sporting events? With millennial fans desiring connectivity as a key part of the sports event, modern stadiums have to deliver an experience for those fans who are as interested in uploading selfies as connecting with their favorite team online. Is this an indicator of what people want next for their experiences? 1 in 3 college students claims Internet connectivity is as important to them as air, food, or water! Delivering a connected experience is critical to providing a superior customer experience. There is a 50/50 split on uploading and downloading, meaning it’s just as important to participate in the game in a different way, such as viewing instant replays on mobile devices, as it is to upload photos to social networks. Join us each month for an informative customer experience webinar. After hosting webinars and courses for PopExpert, Word of Mouth Marketing Association, Marketing Profs, and others, 360Connext is now offering webinars to our community. Sign up to explore different topics each month, like how to measure customer experience success, how to write your customer experience mission, and other important and actionable ideas. Register at www.cxwebinar.com.